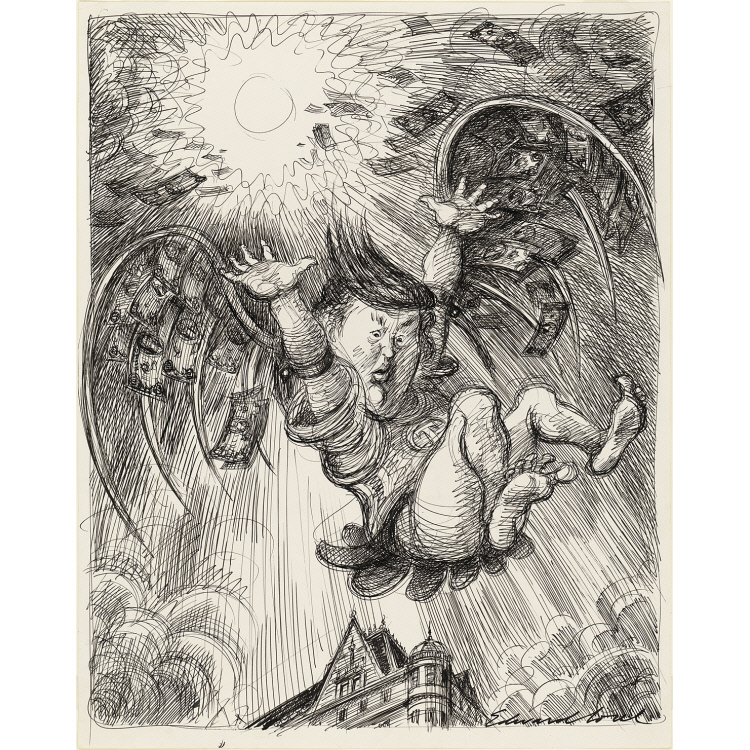 Casting Donald Trump as Icarus, who lost his wings while soaring too close to the sun, in a 1990 caricature for The Nation, Ed Sorel represents the real estate developer as his empire confronted financial crisis. Beneath the tumbling figure, beset by disintegrating wings made of currency, stands the Plaza Hotel, one of the numerous properties Trump controlled at the time. Yet the bravado that led Sorel to brand the seemingly overleveraged magnate as Icarus has also proved one of his strengths. Successfully negotiating a settlement, Trump declared in 1990: “This is a deal that will go down in the textbooks as the way banks and entrepreneurs should deal with each other.” His colorful and bold business persona later became the basis for his hit reality television show, The Apprentice. Not afraid to court controversy, Trump has continued to expand his holdings aggressively and has hinted at possible political ambitions.